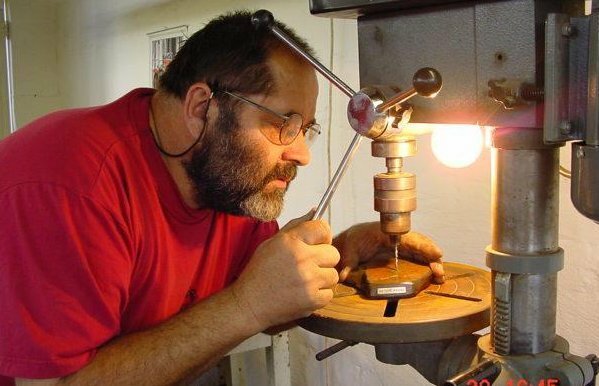 Dietmar built his own foundry in 1997 and is proud to cast all his work himself. He uses high quality bronze and casts in the lost wax procedure as well as using the highly effective ceramic shell technology. Dietmar's bronzes can easily be identified by his stunning mounting techniques and by his very own enhancing patinas. The original sculpture is sculptured out of various materials for e.g. clay, wax, wood, plaster of Paris etc. The original is removed from the mould & a wax replica of the original is made. This "wax replica" is carefully touched up. Runners & risers are attached to this wax replica as well as a "cup" for the pouring of the molten bronze. The "wax replica" is then dipped into various grades of sand and ceramic slurry until a thickness of 5mm is reached. The lid of the cup is cut off and the wax is melted out of the ceramic shell. 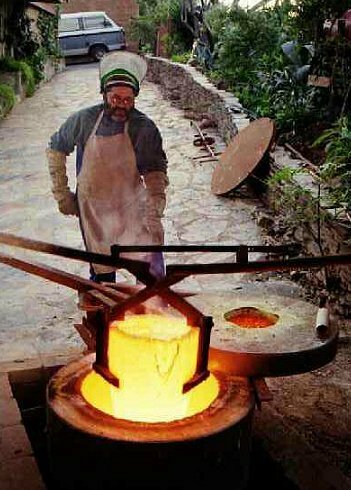 The bronze ingots are melted in the crucible reaching a temperature of 1300'C, which is then poured into the ceramic shell moulds. Once the mould is cooled the ceramic shell is chipped off and the wire removed. All the runners & cup are cut off and now the working off of the piece begins. The pieces are joined, sandblasted, welded, polished & buffed. The patina is now applied and the sculpture is sealed with wax. 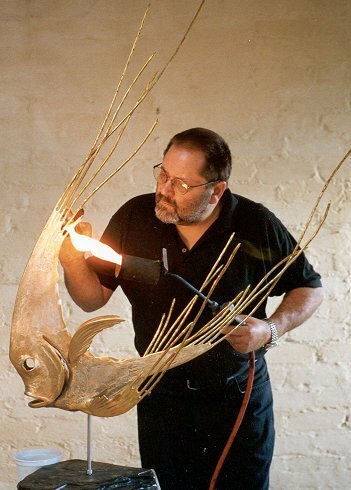 Every sculpture is signed by Dietmar and carries the edition number, which is engraved in the bronze usually under the tail of a bird, and at the bottom of the belly of the fish. The limited edition number varies. "7/15" means this is cast number seven, in a series of fifteen. After this, no more pieces will be cast. Every sculpture receives a certificate of authenticity, which is signed by me. On request an updated valuation for insurance purposes can be obtained. The bronzes are mostly based on Travertine Italian marble, Granite or Slate. Any supportive rods are of stainless steel or brass so the sculptures can be placed in water or outside without rusting. The bronzes are mounted in such a way that the bases can easily be changed in case of a repair. The sculptures are cast in my own foundry. This means that I have 100% control over their quality. 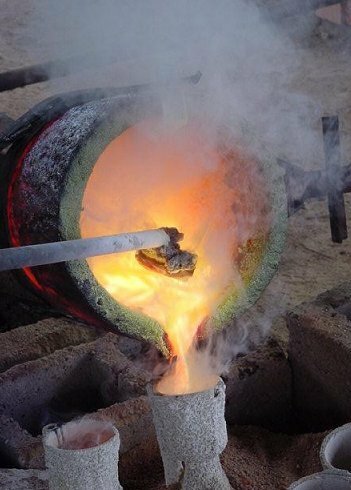 Only certified bronze ingots are used for the casting. The lost wax procedure, as well as the newly effective ceramic shell technology is used in my foundry. The quality of the casting is comparable to Europe's or America's best. The sculptures are not solid metal; only the legs, bills of the birds, fins of the fish etc are solid. The bodies are hollow with a 4-5mm thick wall. Very small sculptures are solid. The simple reason that the bronze sculptures are hollow is that one cannot cast a solid bronze object without facing enormous shrinkage, cracking and deformity of the piece. It would also be totally unpractical to have a larger solid bronze, as it would be enormously heavy. For example, a solid cast bronze sculpture of a life-size adult chicken could weigh up to 50kg, while a hollow cast would probably weigh in the region of 7kg. The colouring of the "bronzes" is done by means of applying "patina". Different acids or chemicals are applied using different techniques. During this procedure the bronze undergoes an oxidation process and changes the bronze to a permanent colour. Care must be taken not to scratch the patina, no two bronzes should rub one another which could cause damage and if necessary would have to be sandblasted and repatined. After this procedure the bronze gets several coats of wax and will then be polished. The wax protects the patina and gives the sculpture a shine. Often my bronzes can be identified by a mottled, marble-like green patina with black edging and buffed up areas to show the golden bronze colour. This is a kind of "trademark" of mine and has proved to be very popular. Dietmar's unique patina formula is kept very secret and has not been matched yet, certainly not in this country. 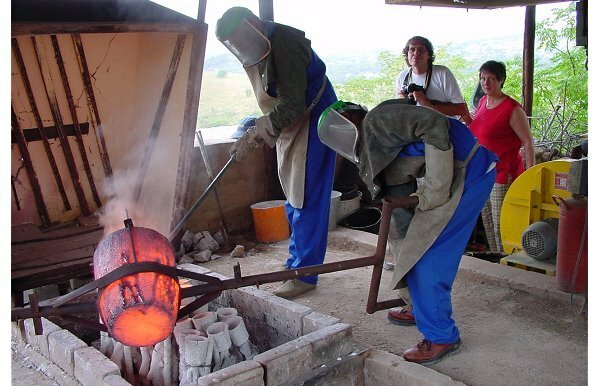 The bronzes have to be handled with care as the metal is not as strong as steel. 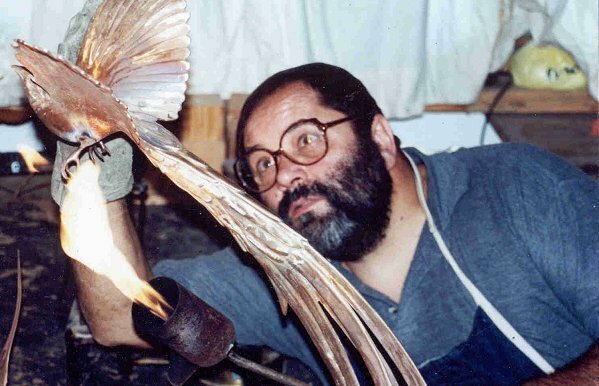 A sculpture for example should never be lifted at its leg, fin, beak or any other intricate part. It should be lifted and held at its base mainly, and gently supported at its body. 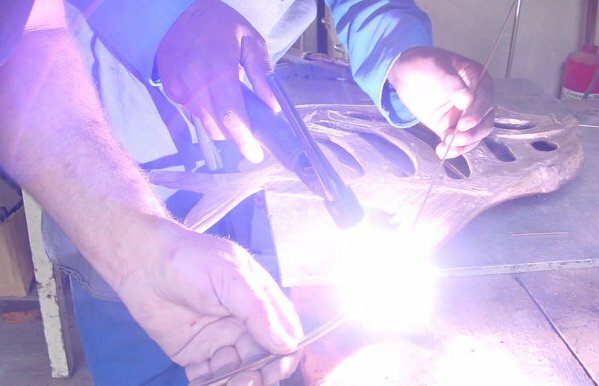 Never drop or bump the bronze, the metal might bend or snap at a delicate part and will therefore have to undergo painstaking repairs, which include sandblasting and re-patina. For transportation the bronze has to be supported against something to avoid slipping and at the same time allowing the pressure to be taken off the delicate parts of the body, especially the fins and the sides, the bottom of the fishes, and the very delicate beaks of the birds, e.g. the Stilt. Preferably the pieces should always be wrapped in bubble plastic and a blanket. It must never lie directly on its side and would be better at an angle leaning against a stronger part of the sculpture. The sculpture is professionally crated in a wooden box. The sculpture is mounted in such a way that it is totally "floating" inside the crate. The sculpture can either be sent by air or sea and can be insured. The good news is that a genuine bronze cast can always be fully repaired after an accident. 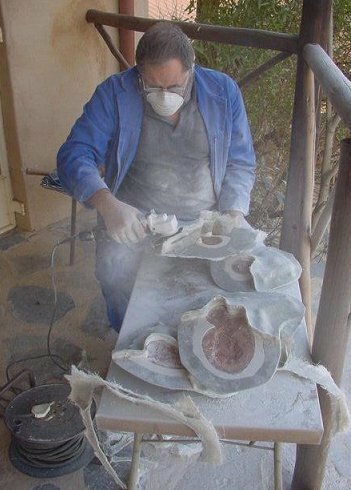 This is not so with a wooden or a soapstone sculpture. It will always be a 'mended' piece. The same applies for a so-called "cold bronze cast" (see the note below). A proper bronze can be fully restored to its original condition by welding and re-patina. If expertly repaired it is nearly impossible to identify a repaired bronze. Its value will remain the same as the original piece. A "cold bronze cast" is often offered as a "bronze". Beware - such a "cold bronze" is not to be compared with a proper "hot bronze cast". "Cold cast" consists of a resin mixed with bronze dust. It does not have the value of a genuine bronze. It breaks easily by chipping or cracking. When it is damaged it is nearly impossible to repair it perfectly and it will be just another mended, glued-up piece, with a much-reduced value. Often a "cold bronze" looks very close to the real thing. Even the weight of a "cold cast" is often faked. As the resin is not as heavy as bronze, some artists fill the inside of the sculpture with Plaster of Paris, to gain weight. One way of finding out what kind of bronze sculpture you are dealing with is that if you tap a thin intricate part of the bronze with a soft object like a wooden pencil, it will "ring" like metal does. If you do the same to a "cold cast" you will get a dead and dull "clonk". In general the bronze requires no cleaning except dusting and polishing with a soft cloth. Cleaning with a metal polish, like for example "Brasso", can brighten the golden areas. This has to be done very carefully so as not to come into contact with the "Patina" (colouring). Finish it off with a coat of bee's wax or floor wax (Cobra). The bronzes are totally weatherproof and will withstand the elements. However, the seaside due to its seawater air might change the patina over the years and a different green colour might appear, which you may find more natural and even more attractive. This applies mainly if the sculpture is placed outdoors and more especially if the bronze is exposed to the spray of the seawater. The changing of the patina can be almost totally avoided by spraying and sealing the bronzes with a coat of special lacquer as well as a coat of wax. Overtime-outdoor pieces can be refurbished. The bronzes do not require any maintenance except perhaps occasionally applying a new coat of wax polish. Ordinary floor polish wax such as "Cobra" is stippled onto the bronze all over with a brush or cloth and then left to dry for several minutes. It has to be rubbed and polished with a soft cloth until a deep shine is achieved. This process can be repeated for extra "depth". The waxing can be done once every 1-2 years. Art collectors will find that investing in a good bronze sculpture can be very rewarding. A bronze is always an investment with a potential to increase in value. The real pleasure in a bronze sculpture lies in the fact, that you can enjoy it on a daily basis. The three dimensional form invites you to touch it and enclose it in your heart. A bronze is an almost everlasting art piece to be passed on from generation to generation.